A man wearing a yellow T-shirt and carrying a backpack is seen walking near the Erawan shrine, where a bomb blast killed 22 people on Monday, in Bangkok, Thailand in this handout still image taken from closed-circuit television (CCTV) footage, released by the Thai Police on August 18, 2015. Thailand’s Prime Minister Prayuth Chan-ocha said authorities were searching for “some suspects” seen in security camera footage at the site where an explosion in the country’s capital late Monday killed at least 22 people and wounded 120 others. He said Tuesday there are people who are trying to destroy the country for various reasons. Experts investigate the Erawan shrine at the site of a deadly blast in central Bangkok, Thailand, Aug. 18, 2015. One suspect authorities said they are searching for appeared in CCTV footage taken at the Erawan shrine shortly before the blast. In the video released Tuesday, a man takes off a backpack and leaves it on a bench before walking away. Authorities said the blast occurred shortly afterward. On Tuesday, another explosion went off near a transit station in Bangkok’s riverside. Police said the small device was thrown from a bridge. CCTV footage showed it falling into the water before it detonated, sending water high into the air but causing no injuries. 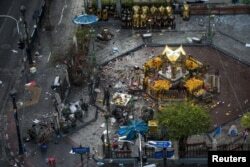 The blast late Monday hit central Bangkok’s commercial Ratchaprasong intersection, close to the popular open-air Erawan Hindu Shrine. Those killed in the explosion include at least six Thais, four Malaysians, three Chinese, one Singaporean, one Philippine national and two Hong Kong residents, a reflection of the shrine’s popularity among Asian tourists. On Tuesday morning, residents and visitors were somber. Australian tourist Grace Evans from Queensland said the bombing occurred less than two kilometers from her hotel and has left her deeply upset. “It’s just too close to home. I mean we could have been at that shrine as far as I’m concerned," she admitted. "We went past it – we could have been [there], because we do those kind of things – we go to temples, we do that kind of thing. Hopefully….. I just feel in my heart there is more to come, I really do, and that’s why I really, really want to go home." The Erawan shrine is located on one of the capital’s busiest intersections, across the street from Bangkok’s police headquarters. The city’s two elevated train lines both pass above the shrine, while a steady stream of tourists and worshippers make offerings and take photos throughout the day. While Thai authorities say they have not confirmed who was behind the attack, they did not rule out a link with the country’s turbulent domestic politics. The shrine’s location is close to areas that have been occupied over the years by different political factions opposing the ruling government. In 2010, government opponents occupied the area for weeks until the army violently pushed them out, which led to several deaths and arson attacks on nearby shopping centers. The area was again occupied by another group of anti-government demonstrators in 2014, which led to the removal of the government led by Yingluck Shinawatra and then the military coup. Over the past year, Thailand’s military government has banned protests and suspended democracy, while insisting that the country is not yet ready for another election. Chris Hannas contributed to this report in Washington.